I am planning to post some favorite Internets sites here…of all kinds of quilty goodness. I will be re-posting and adding here… or that is the plan. BE SURE TO CHECK BACK TO SEE WHAT I HAVE ADDED. Vicky often post interesting information about COLOR THEORY as she is a fabric dyer. She is also working on a COLOR CHALLENGE. If the quilters around here need hand dyed fabric, Vicky is who they order from. Her stuff is wonderful. I love PINTREST! I am posting pictures of my pictures… so much easier. I plan colors for projects. Just finding stuff I really enjoy. Pictures, Pictures and Pictures. Loving it. Spent time with my initial set up but now I just play there in the darkness of the night. I have been posting pictures of my quilts and quilts made by friends and found on the internet… WONDERFUL QUILT INSPIRATION IN ONE PLACE. BACK LATER, I am actually quilting today. Of course…Instant messaging where I connect with Quilty Friends and Family. 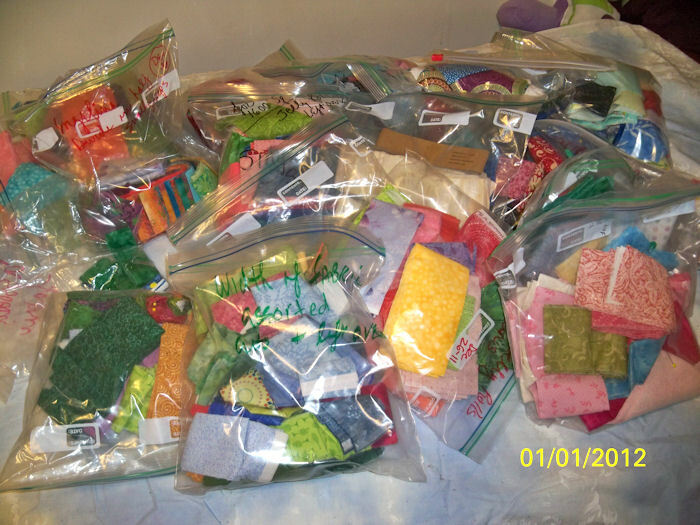 Lots of post from national quilters and great quilty inspiration. Love it come and join me. I have been following Sandy and Jay’s discussion and trying to apply the principles and elements being discussed. I usually do the homework projects but have not posted pictures or made more than an occasional question or comment related to the lessons. For this discussion I went a little further and actually analyzed one of my quilts using the show notes as a guide. I found this to be very helpful in understanding the discussion and using what I learned to my own efforts in design. I have contacted Jay and Sandy requesting permission ( which they have so graciously granted) to post excerpt of the blog and podcast show notes. So here is my evaluation of my quilt using the UNITY as an principle of design. If you want to learn more I strongly suggest you read to Jaye’s blog and listen to Sandy’s podcast. Links provided on this post. If you post a picture of your quilt and with analysis of it’s designs please let me know as I would like to read the post. THANK YOU, NONNIE. Unity cannot exist without other closely related elements and principles (Wolfrom, Adventures in Design, pg.97), which means that this is probably the principle where we will discuss the most other elements and principles. FLORAL FOUR PATCH BLOCKS ARE MIRRORED AND DUPLICATIONS OF EACH OTHER WITHIN THE FOUR PATCH. The four patch blocks are further mirrored and repeated across the quilt. Blocks are mirrored in the corners and from the center out, repeating same / similar pattern motifs top to bottom and kitty corner. Unity of design is achieved by the strong sashing blocking in the four patches. The interplay of the dark and light gold sashing over the quilt highlight the lines and makes strong block sections. The value changes of the light and dark gold colors make a bold block statement, but also connect the strong lines of the quilt. This quilt is composed of is a simple four patch with double sashing in a strong grid / plaid pattern. It is very linear. The interplay of the light and dark gold unites the blocks in a bold statement, despite the simple construction techniques used. It is not the checkerboard pattern but it was built using the checkerboard assembly/ chunk method. The simple four patch is mirrored motifs that repeat made using fussy cut patches. Each of the blocks are repeated elsewhere on the quilt. I tried to balance the motifs by having them kitty corner from each other in symmetrical placement on the quilt. 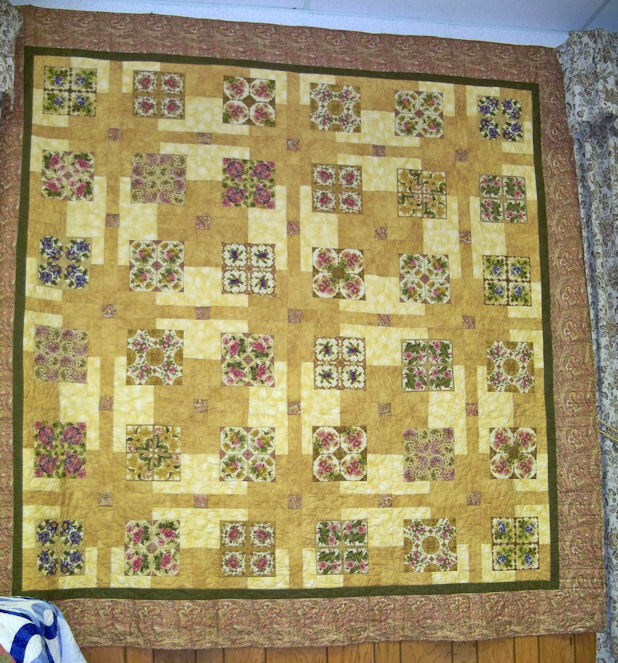 I placed the darkest and strongest of the motifs in the corner and spaced equally in the center sides of the quilt. Despite using the same motifs to make the four patch fussy cut mirrored patches, I change the placement of the motifs to highlight different aspects of the motifs. Each block was slightly different from the other blocks using the same motifs. I had 9 different motifs to work with. I took particular care not to have a motif placed to close to another block using the same motifs. The repetition in this quilt is NOT subtle; it is in fact a strong component in which the over all look is dependent upon. It is how I organized all the fabrics, balanced and deliberately repeated. The right side duplicates the left side of the quilt and repetitive blocks are kitty corner from each other. In this quilt I feel the repeating of the sashing colors anchors and unites the floral motifs. The sashing forms a secondary pattern and kind of takes over and makes it’s own design statement. In a way it overwhelms the primary designs as the squares of the larger then the original floral motifs. Well, this is my analysis of my quilt, FLORAL SPLENDOR. Please post your comments or better yet do an analysis of one of your quilts. Please let me know so I can read it too. added value: cD with pdf files of 10 patterns selected from the book. This is a mixture of Edyta’s personal quilting history with homage paid to the traditional blocks she favors and the quilters who made them. I felt like I was reading her private diary… thoughtful and retrospective; loving and respectful of her family and the traditions in a new country. I have always enjoyed Edyta’s books and the pictures of the quilts in this book make it worth a high rating. I have seen Edyta’s trunk show in person twice and these quilts are even prettier in person. THE QUILT SHOW is reaching out to quilters. The are allowing members to send out a FREE SHOW to their friends and fellow quilters. I have sent out a gift certificate to all the commentors I have had on my podcast and word-press blogs since I started a year ago. This offer is good from THE QUILT SHOW for most of January. YOU probably would have to sign up as a free member which means you register and supply some basic information and emails address. I am willing to send out a gift certificate as long as I am able ( I do have a full time job) to anyone that leaves a comment on my blog here at word-press or at pod-bean. I plan to check each day for comments and then send out the certificates. LEAVE A COMMENT, I will need your email address to forward the gift certificate. If there is a particular person you would want to see from the last season of TQS let me know and I will try to accommodate your request. (I have access to series 800 and 900, until January 5th, 2012. After that I will have a limited number of shows I can send out.) IF you do not choose I will just choose one at random. Only one show per email address. I love THE QUILT SHOW and want to share it with my quilting friends. HOW I spent my my SEW-IN vacation – – -2012 QUILT RESOLUTIONS AND GOALS. My Secret Santa Guild Gift.... getting me into so much Trouble. Added stash fabrics to blend with the Cattail and Clover jelly rolls. Anyways, I went home and started matching fabrics from my stash to the colors in the jelly roll. Anything that blended with the original jelly roll, look good, got added. Not enough lights, I started pulling lights I would put with the darks. Most of the lights are not in the original fabrics but are what you would get if you added white to the colors in the original jelly rolls. And this is what I would get. The above picture is what I hope to be able to use; the final selection, would be on the design wall. 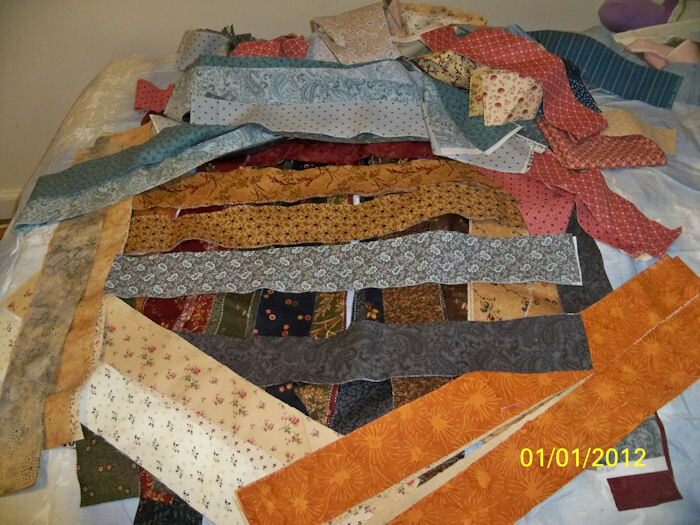 Cut Stash fabric into 2-1/2 inch and strips of fabrics for quilts. For the BOXING DAY SEW IN and the NEW YEARS EVE SEW IN, I had only had scattered intervals of time to work on getting ready for my up coming quilt projects. The projects require strips so I have been going through my stash and cutting first jelly rolls and then paired matching strips of assorted sizes. I cut them up from width of fabrics and fat quarter, plus stash fabric that would give me the required strips. I am now ready to start on my quilting projects. The third picture is just some of the strips I have cut up, my brights. 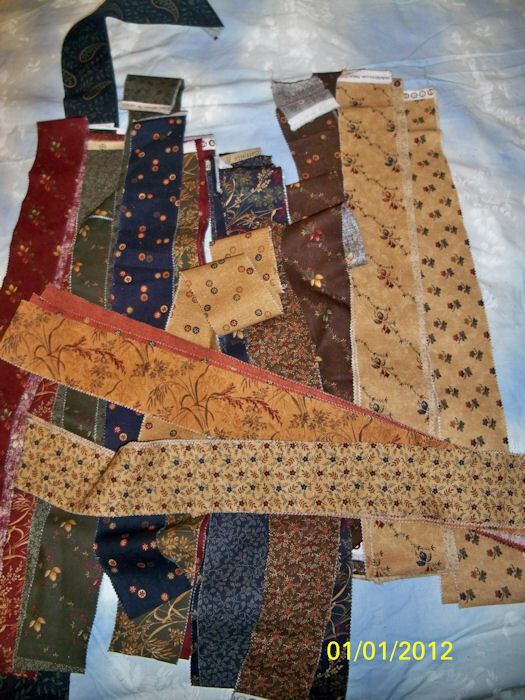 I have another box of strips cut from traditional fabrics. I just want to thank everyone at the SEW INs and Sandy, Tanesha, Pam and Darla for organizing these activities. If you did not participated plan on coming to future SEW INs. I am sure these ladies will be planning more such activities. So if you have not joined us on TWITTER yet, please come by, I am sure you will find someone to talk to. I am NONNIE_P. You can then connect with the other quilter and a whole bunch more.